How can communities enhance social-ecological resilience within complex urban systems? Drawing on a new urbanist proposal in Orange County, California, it is suggested that planning that ignores diverse ways of knowing undermines the experience and shared meaning of those living in a city. The paper then describes how narratives lay at the core of efforts to reintegrate the Los Angeles River into the life of the city and the US Fire Learning Network’s efforts to address the nation’s wildfire crisis. In both cases, participants develop partially shared stories about alternative futures that foster critical learning and facilitate coordination without imposing one set of interests on everyone. 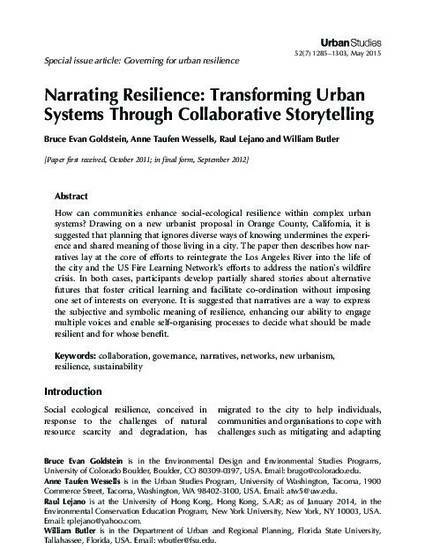 It is suggested that narratives are a way to express the subjective and symbolic meaning of resilience, enhancing our ability to engage multiple voices and enable self-organising processes to decide what should be made resilient and for whose benefit.